I was lucky enough to get to capture Logan's first couple of hours on earth, with the sun setting thru the wall of windows in Jodi's room at the Naval Hospital Pensacola. It was my first time shooting in this hospital and WOW! I love it. The rooms are huge and full of light! If I ever have another baby I might have to join the Navy so I can deliver here. Birth Photographer Pensacola FL The Navy needs photographers...right? Anyway, back to the baby stuff. You are about to be bombarded with some serious sweetness. 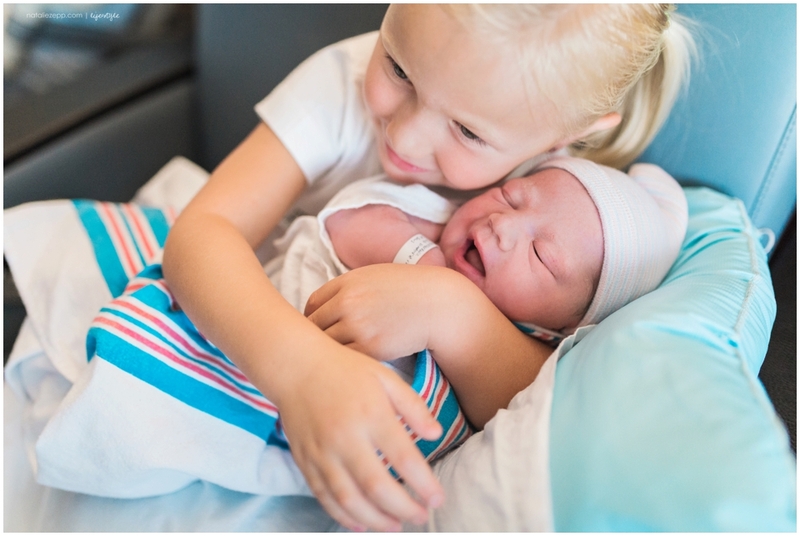 Some of you might just melt a little when you see the utter adoration that Ryleigh and Dylan have for their new baby brother Logan. And some of you might turn a little green over how gorgeous Jodi is...just an hour after labor. I heard Ryleigh's sweet little voice and turned around to see her hug mommy and whip back around to run and see her new baby...I'm pretty sure she's claiming Logan as her own. I made her stop for a picture of her shirt. Big brother Dylan was so excited to see Logan that he had to Facetime on his way to the hospital. It looks like Logan was pretty excited too. But when Dylan arrived, Ryleigh was thrilled to share Logan with him. It was just a total sibling love fest! They couldn't have been more perfect it they'd tried. Welcome to your family Logan. You got a good one! If 50 people comment below, Jodi and Rod will receive an 8x10 mounted print of an image from this session (a $40 value). Help them out and leave a quick note.